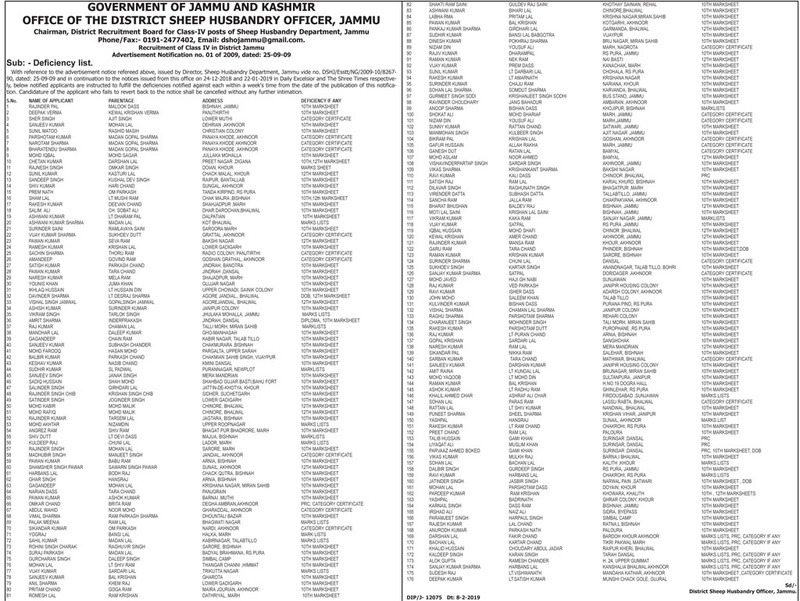 J&K Sheep Husbandry Department Deficiency list of Class-IV posts. Deficiency list. With reference to the advertisement notice refereed above, issued by Director, Sheep Husbandry Department, Jammu vide no. DSHJ/Esstt/NG/2009-10/826790, dated: 25-09-09 and in continuation to the notices issued from this office on 24-12-2018 and 22-01-2019 in Daily Excelsior and The Shree Times respectively, below notified applicants are instructed to fulfill the deficiencies notified against each within a week’s time from the date of the publication of this notification. Candidature of the applicant who fails to revert back to the notice shall be cancelled without any further intimation.